This craft is for the younger kids who need to practice using a crayon, glue, cutting out shapes, drawing shapes, following instructions, and handling small objects. The snowman pictured here was made by my son John a long time ago. It's been hanging in a hall closet for a long time. I thought it was too cute to put away in a box. How you decide to go about this is up to you. Decide the method based on what your child needs to practice most. Methods are listed on the right in the blue sidebar. Skills: cutting, pasting, drawing, and following instructions. I am providing a snowman template that you may print. Use the template either as shapes that are cut out or use it as a stencil where you cut out the insides of the shapes. 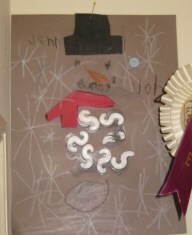 In the original snowman picture shown above, the circles were pre-drawn on the mid-tone construction paper. The hat and scarf were drawn by the parent/instructor on black and red construction paper. The child cut out the scarf and hat and glued them in correct locations on the snowman. 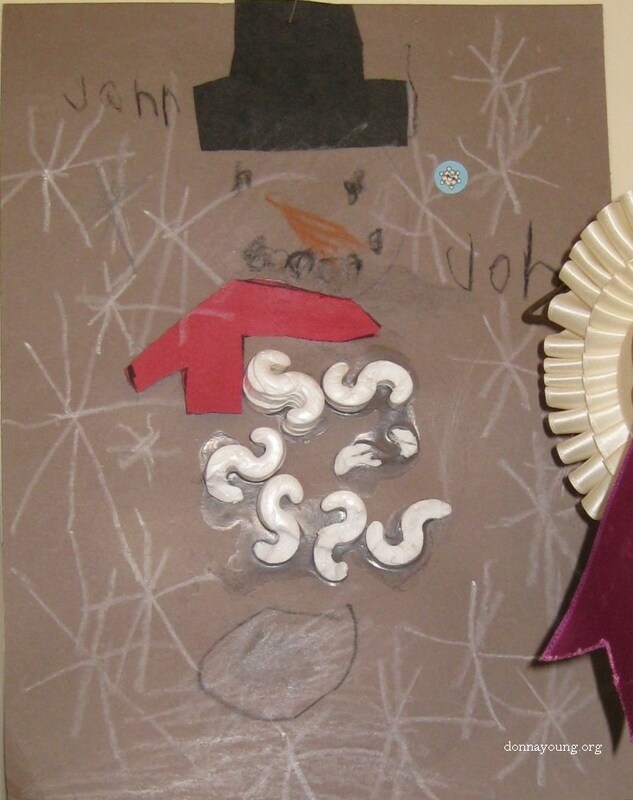 Then the child decorated the picture by drawing the snowman face and carrot nose, gluing styrofoam popcorn on the body, and drawing "snow flakes" on the picture. Easiest - You do all of the cutting out. You draw the snowman circles on the paper. The child assembles, glues, and draws. Medium - You prepare the picture as stated in the "Instructions for Image Shown Above". Hardest - The child colors the hat and scarf on the template set, cuts out all of the template pieces and arranges them on paper, glues template pieces in approximately the right places and decorates the picture by drawing the snowman face and carrot nose, gluing styrofoam popcorn on the body, and drawing "snow flakes" on the picture.